BeeHive204AP - Glorious Green PCB Co.,Ltd. Whole system is scalable up to 64 programming sites in one automated programmer by multiplying of BeeHive204AP programmer and BeeHive204AP control unit. 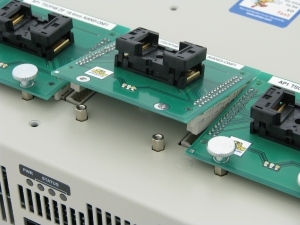 Maximal configuration comprise of 16x BeeHive204AP programmers and 8x BeeHive204AP control units. 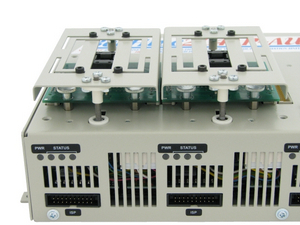 One BeeHive204AP control unit in the system serve as a master unit. Here is running also multiprogramming control software, serialization engine and interface to the host system. Interfacing of BeeHive204AP control units is done over standard LAN and external LAN switch. Interfacing of BeeHive204AP master control unit and host systems is over LAN (other interface on request). The selected way of the BeeHive204AP implementation into automated programmer or handler depends mainly on the type of chips you plan to program. Let’s assume, the mechanical arm movement time, from picking up chip from the input tray (tape, …) to chip insertion into ZIF socket of programmer, including fine positioning by camera, is 5 seconds. The time between chip removing from ZIF socket of the programmer and placement of chip to output tray (tape, …) is 3s. Together it is 8 seconds, multiplied 7 sites (until one site is served, 7 sites are working) it is 56 seconds. Because the high programming speed of BeeHive204AP, only really large memories have programming time that exceed this time – and then the usage of BeeHive204AP control unit is needed for totally balanced performance of both programming system and handler. , except the programming adapters that use ClamShell version of the ZIF socket (mainly adapters for BGA packages). We’re continuously working on the finding of proper open-top ZIF sockets for such programming adapters. 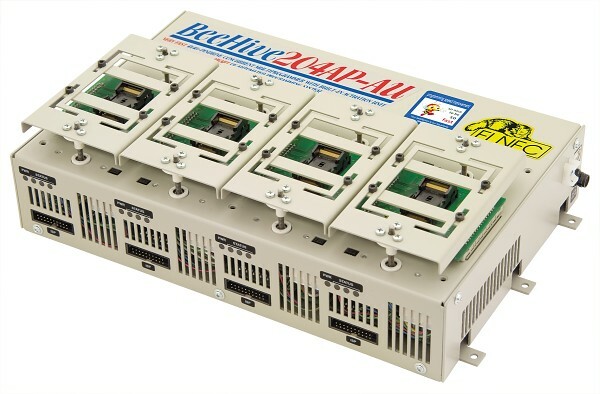 for implementation of BeeHive204AP into 3rd party automated programmer/handler without ZIF socket opener is available version of BeeHive204AP with ZIF socket actuation system: BeeHive204AP-AU. 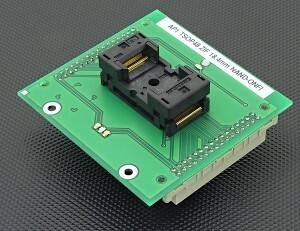 the ZIF socket actuation unit is designed for all kinds and sizes of ZIF sockets used at programming modules. Simple design allow to apply pressure exactly symmetrically to top of ZIF socket and it keep mechanical life of ZIF socket as long as possible. smart design of pressure plates is designed to be easy adjustable and the pressure can be applied to ZIF socket at proper place. dimensions of BeeHive204AP-AU programmer: 310x205x96 mm ( 12.2 x 8.1 x 3.8 inch). BeeHive201AP-AU height is measured with pressure plate at upper position.